Best of all…NO BATTERIES REQUIRED! The car is run on the pumping action of the included pump. 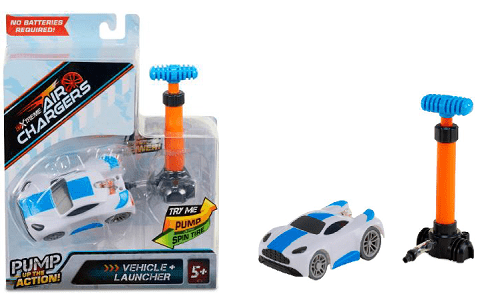 The Air Chargers Vehicle & Launcher are so easy to use and endless amount of fun. You can have just one car, and send it racing or doing stunts, or have multiple cars and have them race and attempt stunts in a competition. The Air Chargers vehicles are well made and can take a beating with the stunts. I am quite impressed with them. They are a pretty good size also. These Air Chargers are not the size of smaller diecast cars. You can see in the video above that they are a pretty decent size so you can set up plastic cups, blocks, or pretty much anything you can dream up, to have your Air Chargers race through or do stunts with. The Air Chargers are great for individual play time for those that like cars as well as when friends come over for some group play time. I can see the LT Extreme Air Chargers Vehicle & Launcher being an affordable, hot item this holiday season. It is engaging for those that love cars and racing them and parents will love that they do not use any batteries.